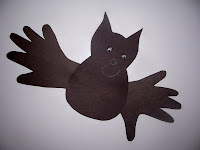 Batty is our second handprint Halloween activity. Very easy--not as many steps as the witch. 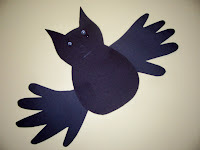 First take a piece of black construction paper and have the children place both hands on the paper, fingers wide. 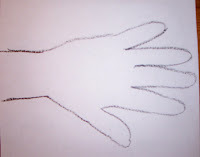 Trace around both hands with the white crayon. Here if you have older children, let them cut these out--if not you will have to cut them out for them. When tracing, trace up the wrist a little for gluing purposes. For the bats body the cut out is fairly simple. I drew mine freehand. Since this would be symmetrical, you could draw half a body on the fold of a paper. The next step in to a) cut this out yourself, or b) have the children cut this out. (You can see my freehand drawing is far from symmetrical, so I am probably better off with the fold cut:). Whenever I make a new project, my first pattern is done on oaktag so that I have a template to trace for future use. Finally all the pieces get glued together. The bats wings should come out of the back of the body shape--the children should put glue just on the wrist part of the hands. Finally--add a little face with a white crayon and those adorable wiggle eyes and he's ready to head off into the night sky. We made a family of bats this week! Even Dad participated- they look great! Thanks so much for the idea!